Today I’m going to start off with a look at the big picture. The next chart pretty much says it all. 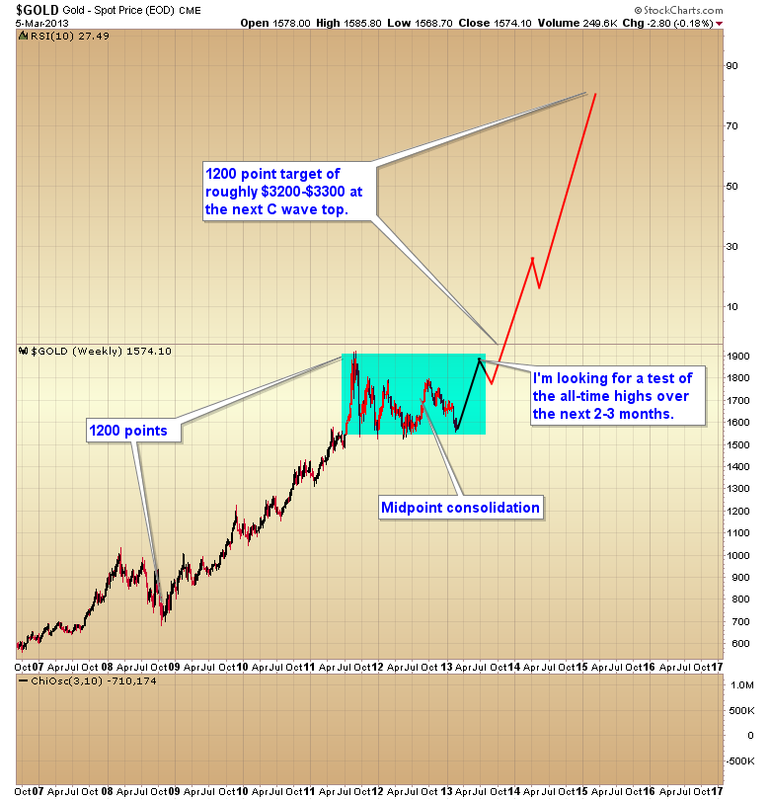 There is a fundamental reason why gold has been going up for 13 years. That same fundamental is driving the cyclical bull markets in stocks. For gold the fundamentals are sustainable and that’s why the gold chart is rising almost parabolic inter-spaced with normal corrections/consolidations along the way. For stocks the fundamentals aren’t sustainable. You can’t drive a true bull market in stocks by printing money. It just creates bubbles and crashes. That’s why each one of these bull markets is followed by a devastating bear market. It’s why the stock market chart has gone nowhere in 13 years while gold has gone up, up and away. Until the fundamentals change this pattern isn’t going to change. Pretty soon the stock market is going to stagnate and start to drift sideways (followed by another bear market, probably due to bottom in 2016). Pretty soon gold is going to generate another C-wave leg up (followed by another sharp move down into the next 8 year cycle low, also due in 2016). Did we bottom two days ago or not? I don’t know. What I do believe is that the QE4 manipulation has basically created a double B-wave bottom. As we saw last summer, B-wave bottoms are frustrating SOB’s that whipsaw back and forth until everyone is knocked off, or dizzy and ready to puke. Then they take off and leave everyone behind. As we saw last summer, B-waves can churn to the point were it’s pretty difficult to determine correct cycle counts. It appears to be happening again. Considering the current daily cycle is left translated it should drop back below $1555 before bottoming. That being said today’s move looks like the cycle low may have come on Friday. I wouldn’t count on gold to give us a clear signal in this environment though. So it’s anyone’s guess if we now have a strange left translated daily cycle that bottomed above the prior low. For those of you trying to hold on to positions during this mess let me put up two more charts. On the gold chart you can see the level that triggered a 99 and a 98 Blees rating on the COT report. Historically that kind of extreme only occurs when price is at, or very close to a final intermediate bottom. You can also see that this price level generated an 88 million buying on weakness day in GLD. Again this is almost always a sign that price is about as low as it’s going to go. Let me emphasize I said price, not time. Just because price has reached a level that halts the selling doesn’t necessarily mean that a sustained rally will start immediately. As we have seen the market may still have to chew up a significant amount of time before it’s ready to take off. In our case I think gold is waiting for the stock market to stagnate before hot money starts to flow back into the sector. This bottom is going to be too complex to time perfectly, and even if it did bottom on February 20th it’s already shown that it can still throw most people off just by chopping back and forth for a month. Maybe that chop has finally ended. Maybe the daily cycle is still going to make one more trip below $1600. I’ll let others compete to see who can second guess the next wiggle in the precious metal markets. All I can say is that the signs are there. Save your head the abuse two years from now and pay attention to them. This entry was posted in Uncategorized on March 28, 2013 by Gary. Folks in the real world it just isn’t possible to have a strong dollar if you are counterfeiting 85 billion of them a month. That’s just basic common sense, which seems to be an extremely rare commodity in the world today. Yes, markets can be irrational, because humans are driven by emotions. When something goes up or down for a long period of time, our emotions invent reasons for why it’s happening. We convince ourselves that a tulip bulb really is worth more than a house. We justify skyrocketing housing prices far above average income levels by inventing a fantasy that we are running out of land. Of course no amount of fantasy means we can escape reality, just that the longer the illusion extends the bigger the bubble grows before is pops. But there is never any doubt it is going to pop. There is one reason and one reason only why the dollar index has the illusion of being strong (let’s face it at 82 the dollar is hardly strong. In 2000 the dollar index was at 120). The dollar is strong lately because the yen, pound, euro and Canadian dollar have all been dropping sharply into major intermediate and yearly cycle lows. This is pushing the dollar index up. It doesn’t mean the dollar is strong, just that most of the currencies that the dollar index is measured against are exceptionally weak at the moment. But that may be changing. On Friday the dollar broke down and breached the intermediate trend line. This is often the first warning sign that an intermediate cycle has topped. If the last daily cycle pivot is broken (lower low) it will almost certainly confirm that the dollar has begun an intermediate decline. There is now extreme risk that the second daily cycle has topped on day 2. That is one of, if not the most extreme left translation I can remember, and is likely to lead to a very large decline over the duration of this daily cycle. Keep in mind there should be another 2 or 3 daily cycles down after this one before the final yearly cycle low sometime in June or early July. If the dollar daily cycle has topped on day two, then the dollar is setting up to take a real beating over the next couple of months. I’m afraid reality is about to return to the dollar, and the consequences of printing a trillion dollars a year are about to be begin. Next I want to discuss another subject that should be easily visible, but again a lack of basic common sense prevents most people from seeing what’s right in front of them. I’m talking about inflation. Now if you believe the governments ridiculous CPI numbers, or the talking heads on TV, you might come to the conclusion that printing 85 billion dollars a month has no long term side effects. You would of course be 100% wrong. It causes inflation. Money printing always has, and always will cause inflation. This time is no different than any other time in history. I can assure you that Bernanke hasn’t been able to repeal the natural laws of the universe. As a matter of fact we have had massive inflation ever since the bottom in 2009. Because the Fed targets asset prices, it tends to start in those areas that we don’t normally associate as inflationary. Let’s face it, no one is really going to freak out about a rising stock market, but that is the first sign of inflation. The Fed’s liquidity has to land on something, and it usually starts in the stock market first. Unfortunately it always eventually ends up in the commodity markets. Folks no matter what anyone one tries to tell you, it’s not possible to print 10+ trillion dollars and not get inflation. The Fed would like the inflation to stay in the stock and real estate markets, but as we all know it’s not possible to escape reality, and the reality is that eventually that liquidity is going to leak out of the stock market and real estate markets and find it’s way into the commodity markets. It happened in 2008 and it’s going to happen again. As you can see in the long term chart above inflation began in the stock market and real estate markets in the early 2000′s. It culminated in a massive parabolic spike in commodity prices in the summer of 2008 that destroyed the global economy and spiked oil to $147 a barrel, and gold above $1000 an oz. This time will be no different. We have massive inflation in stocks, and even an echo bubble forming in the real estate markets. Ultimately the story is going to end the same way as it did in 2008, with a stagnating stock market, a second crash in the housing market, and another parabolic move in commodities. It absolutely will drive another C-wave advance in gold just like it did in 2008 and 2011. Only this time the move will be even bigger. As I’ve noted in several past reports, I’m confident that gold is forming a midpoint consolidation in a very large T1 pattern that should ultimately target about $3200-$3300 at the next C-wave top. It doesn’t matter whether sovereign central banks impose short term manipulation or how irrational the short term movements get, nothing is going to alter reality, and the reality is that printing a trillion dollars a year is going to drive another C-wave in gold’s secular bull market. End of story. This entry was posted in Uncategorized on March 23, 2013 by Gary. While I suspect this is probably the furthest thing from what most investors expect, I think the dollar index is very close to forming another major top, and once it does it should release oil, gold and the rest of the commodity index from their extended corrections. Granted no one believed me when I called the major three year cycle low in the CRB last summer either. 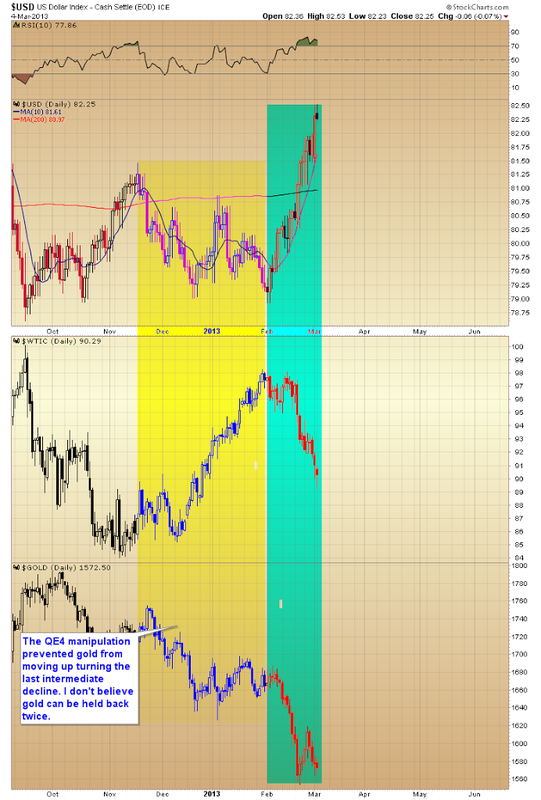 As you can see in the next chart, as soon as the dollar began to rally out of its last intermediate bottom, commodities, including oil and gold, all began to move down into major intermediate degree declines. For gold this has turned out to be one of the most difficult yearly cycle lows of the entire bull market, other than the eight year cycle low in 2008. I know it doesn’t seem like it but I can assure you that the gold bull market is not dead. This is just a very severe move into a yearly cycle low. Granted it is one that was exacerbated by some short-term manipulation right after QE4, but still just a normal cyclical decline that tends to occur most years in early spring. Since this particular yearly cycle low has been so severe it should act as the spring board for the next major leg up in the secular gold bull market. 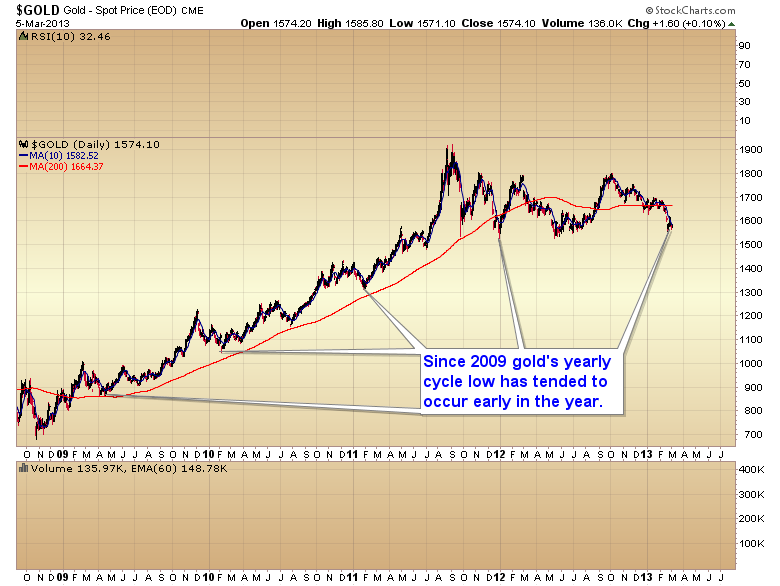 As we have seen in the gold market, a move down into a yearly cycle low tends to be the most severe cyclical decline. Now it is the dollars turn to move down into a yearly cycle low. Over the next 2-3 months we should see the dollar retest, and then break through the 79 support zone. When it does I expect to see a waterfall decline similar to what has transpired in the Japanese Yen and the British pound recently. This should drive the next leg up in the CRB’s rally out of its three year cycle low, and trigger the first real inflationary surge, which I think will culminate in a massive spike in commodity prices sometime in late 2014 or early 2015. 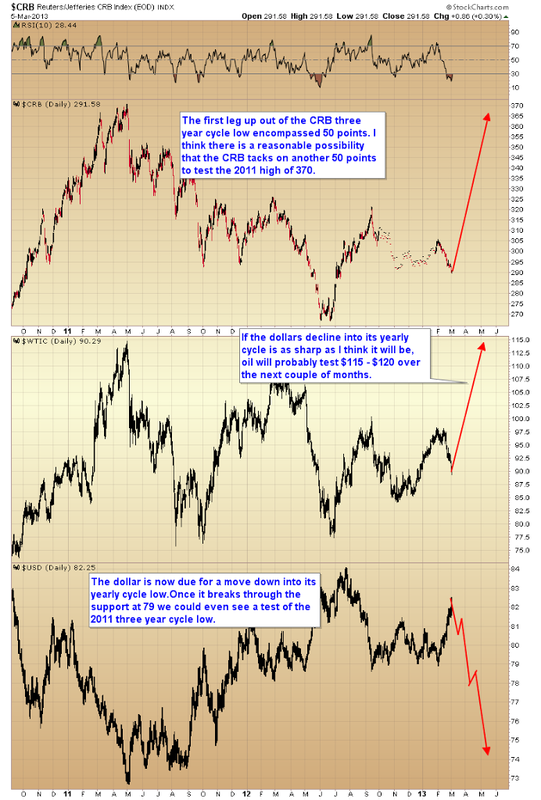 I also think the expected hard move down in the dollar will trigger a violent rally in the precious metals market. Conversely as the move down into a yearly cycle low tends to be the most severe, the rally out of a yearly cycle low is often the most aggressive. Considering the extreme oversold technical, and sentiment levels in the precious metals market, we now have the conditions necessary to power a violent rally, at least to test the 2011 highs over the next 2-3 months. Once that test is complete we should see gold break out to new highs on its way to an expected final T1 PATTERN C-wave top somewhere in the neighborhood of $3200. Since currency cycles often turn on the monthly employment report, I think there’s a good chance that the dollar index is going to put in its intermediate top either Thursday or Friday. I think the odds are about 50/50 that gold has already completed its yearly cycle low slightly ahead of the dollar on February 20, and oil & the CRB may have formed final intermediate bottoms on Tuesday. If not then they may wait for a final top in the dollar, although usually commodities will sniff out a currency turn a few days early, and gold often by a week or so. Based on the COT reports, commercial traders are already positioned for the next leg up in gold, and institutional money has been entering the precious metals market in a big way as evidenced by the buying on weakness numbers in GLD on February 28. It shouldn’t be long now before all of the traders that have given up on the precious metals sector get reminded that this is still a secular bull market. And secular bull markets continue to rise until the fundamentals reverse. In the 70s and 80s gold rallied until Volcker reversed monetary policy 180° and raised interest rates to 20%. Bernanke is still stuck in Keynesian monetary theory and is showing no signs of reversing policy any time soon. Until Fed policy changes the gold bull market will remain intact. This entry was posted in Uncategorized on March 6, 2013 by Gary.